This paper examines the evolution of energy use and its influences in the United Kingdom over the very long run by combining economic literature and statistical information. The paper argues that the provision of energy services, mainly heat and power, is bound by the tensions between a changing growth rate and structure of economic activity and the constraints of energetic resources. After periods of tension, energy price differentials, as well as the diffusion of technological innovation and the development of new fuels, led to new mixes of energy sources to supply heat and power. 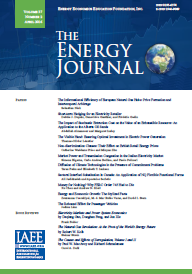 This paper identifies three major changes that characterise the history of UK energy use: first, the dramatic increase in per capita energy use; second, the shift in methods of supplying energy services, from biomass sources to fossil fuels, from coal to petroleum to natural gas, and from raw forms to more value-added energy sources; and, third, the replacing of direct methods of generating power, from animate sources, wind and water, by the use of mechanical and electrical methods, which have so far depended mainly on fossil fuels. These changes were instrumental in influencing the relationship between GDP and energy use, and also the levels of environmentalpollution. Artificial neural networks are beginning to be used by electric utilities, to forecast hourly system loads on a day ahead basis. This paper discusses the neural network specification in terms of conventional econometric language, providing parallel concepts for terms such as training, learning, and nodes in the, hidden layer. It is shown that these models are flexible nonlinear equations that can be estimated using nonlinear least squares. It is argued that these models are especially well suited to hourly load forecasting, reflecting the presence of important nonlinearities and variable interactions. The paper proceeds to show how conventional statistics, such as the BIC and MAPE statistics can be used to select the number of nodes in the hidden layer. It is concluded that these models provide a powerful, robust and sensible approach to hourly load forecasting that will provide modest improvements in forecast accuracy relative to well-specified regression models. The U. S. EPA's infant market for SO2 emissions has the potential for improving the cost effectiveness of reducing acid rain pollutants. If the market works as planned, over time one should see the cost of reducing additional amounts of sulfur dioxide converge across plants. The results of the study described here demonstrate that before the market opened marginal abatement costs varied wildly across plants. This work provides estimates of the shadow price of SO2 abatement using the output distance function approach for Illinois, Minnesota and Wisconsin coal-burning electric plants. The results demonstrate that the coal-burning electric plants with the highest emissions rates are also the plants with the lowest marginal abatement costs, a fact that may explain lower-than-expected prices in the new market for allowances. The data include information about plants with installed scrubber capital allowing for an investigation of the effect of scrubber capital on marginal abatement costs. This paper analyses long-term trends in energy intensity for ten Asian emerging countries to test for a non-monotonic relationship between energy intensity and income in our sample. We estimate energy demand functions during 1973 1990 using a quadratic function of log income. We find that the long-run coefficient on squared income is negative and significant, indicating a change in trend of energy intensity. We then use our estimates to evaluate a medium-term forecast of energy demand in the Asian countries, using both a log-linear and a quadratic model. We find that in medium to high income countries the quadratic model performs better than the log-linear, with an average error of 9% against 43% in 1995. For the region as a whole, the quadratic model appears more adequate with a forecast error of 16% against 28% in 1995. These results are consistent with a process of dematerialization, which occurs as a result of a reduction of resource use per unit of GDP once an economy passes some threshold level of GDP per capita. Crude Oil Prices and U.S. Economic Performance: Where Does the Asymmetry Reside? Sustained decreases in crude oil prices appear to affect the U.S. economy differently than sustained increases. This paper shows that a significant part of the observed asymmetry is due to adjustments within the energy sector and not within the rest of the economy. In particular, sustained decreases in petroleum product or general energy prices do not appear to have qualitatively different macroeconomic impacts than do sustained price increases. The singular focus on crude oil price changes in previous studies is misplaced. Moreover, the 1986 oil price collapse did not operate in isolation from other important events. As crude oil prices fell in the 1986 period, other factors caused a major devaluation of the U.S. dollar that had potentially important effects on the U.S. economy. We modify the approach to valuing mineral reserves that is current in economic literature by considering a net present-value rule under uncertainty. Direct application of Hotelling's rule is found to be inappropriate. The modification is such that the present value is approximately half that proposed by the Hotelling Valuation Principle.